This is a game that pitches two former European champions against each other and if you solely focus on statistics, it should be a straightforward win for the hosts. This is because they have a 9-0 record against Zalgiris and this season, Kaunas have lost both of their games that have been played away from Kaunas. The hosts hold a 1-3 record this season and they know that they’ll need to change that around in this game. 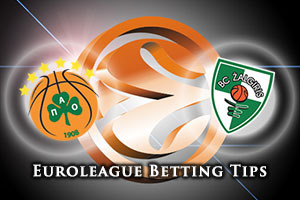 History may favour them against Kaunas but the current form of Panathinaikos will leave no one in the home feeling overly confident about triumphing in this game. There is every chance that James Gist will have to sit this game out so you will be looking for players like Dimitris Diamantidis and Nick Calathes to be the key players for the hosts on Friday evening. Paulius Jankunas is another player that needs to find some form in this match. The away team will have two players who have tasted Euroleague success with Panathinaikos, Robertas Javtokas and Ian Vougioukas, so they will likely receive a warm welcome from the Athens crowd. However, as soon as the game starts, there are no friendships on the court. If the away teams wants to get a grip on the match, they’ll need to block out some big players in the home team and this is where Renaldas Seibutis and Olivier Hanlan could have a big part to play in deciding the outcome of this game. It’s a tough one for Kaunas but coming from a passionate basketball city, they won’t be spooked by the loud crowd in Athens. They’ve been far from their best this campaign but the bookmakers still think that the hosts will take control of this game. You can find them at -8.5, with odds of 1.90, on Friday night. If you have more interest in the Over/Under market for this game in Group C, look to go OVER 146.0 which is available at odds of 1.90. Bet Now!